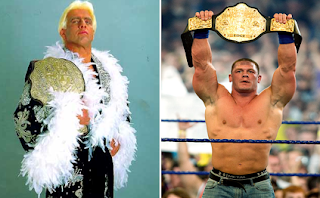 I've read a lot of other sites in the last couple of days with writers worked up about the fact that John Cena is now at 12 champion reigns, putting him only four behind the magical "Sweet 16" that Ric Flair held. Let me preface this post by saying Ric Flair is my all time favorite wrestler, and I do not hate John Cena. I actually like the guy. So please, don't think I'm hating on anyone because I'm voicing my opinion. Oh, and for the sake of argument, I'm referring to Cena's run as WWE and World champion as one, so consider that. His first win was in 2005. It's 2011. So in 6 1/2 years he's held the title 12 times. Remember, Bruno Sammartino once held the WWF title for 7 1/2 years STRAIGHT. Flair won his 16 world titles over the course of about 15 years (give or take) So that's another reason I don't get so worked up about this. Flair had title runs that lasted more than a year in some cases. I don't bring this up to put Cena down, it's just to me does winning a title X amount of times mean more than the length of time the championship was held? When you add up Cena's reigns to date (September 2011) he's at 1,050 days. For Flair (combining the WWF, WCW, and NWA reigns) it's 3,720 days. This is approximate as I've found the info on line and did the math as best I could. So while I still believe there is an importance associated with the heavyweight title, I think that the playing of hot potato with it has devalued the championship (all of them). And again, I'm old school and say it's the quality of the title reigns and not the quantity that will matter over time. I have no doubt that John Cena will match the 16 title runs, probably even exceed it. But I seriously doubt he'll add another 2,700 plus days to beat Flair. I'm curious what you think. Is this much ado about nothing, or do wrestling fans have a legit gripe? Post here or on Facebook, Twitter, or YouTube. And remember, we are only talking about the WWE title. 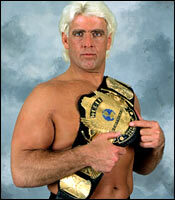 That is nothing compared to ALL the championships that Ric has won throughout the entire business. Why focus on one belt? Err... title. FYI: Your post a comment button and preview button are buggy. Always frustrating to deal with. Love the site.